Market spaces are very dynamic in nature. In an attempt to cope with these constant changes, market participants are frequently in need of research and consulting studies. We take pride in serving our clients with the utmost quality with requirements tailored to render cost effectiveness. 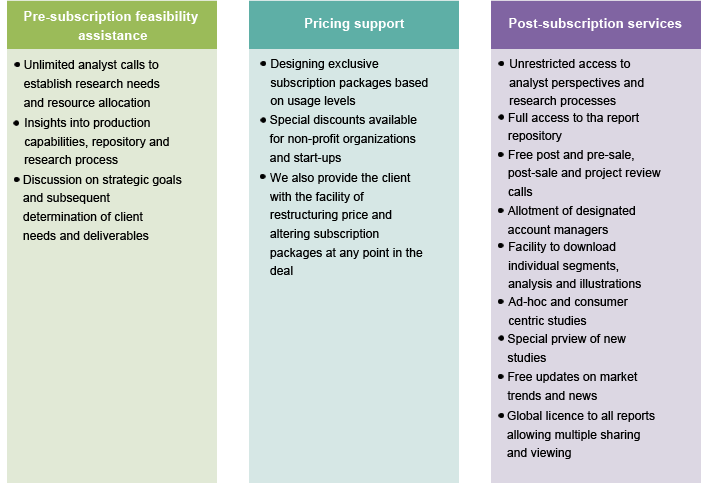 Pre-subscription feasibility assistance: Interact with our panel of analysts to decide the best possible access to our repository of reports. Discuss strategic goals and tailor studies, best suiting your requirements. Pricing support: Contact our sales team to devise personalized price structures exclusively designed to meet your usage levels. We provide special discounts to start-ups and non-profit organizations. We also provide the client with the facility of restructuring price and altering subscription packages at any point in the deal. This service will enable unrestricted access to analyst discussions in an attempt to service clients in the best possible manner. Gain full access to a wide array of studies (over 1,000) published across all industry verticals. Receive free post and pre-sales assistance calls and free project review calls with our analysts. Unrestricted sharing and data usage by receiving free global licenses. Free analyst briefing on pertinent ongoing projects. Receive free updates on market trends and news and subsequent impact analyses. Accessibility to download individual segments, analysis and illustrations (graphs, tables etc.). Availability of ad-hoc, fully customizable and consumer centric benchmarking studies. Availability of studies composed in all formats (PDF, MS Word, and Spreadsheet). Clients will be allotted designated account managers who will act as single point of contacts. Availability of special previews of new studies to ensure our clients gain competitive advantage in their respective fields.